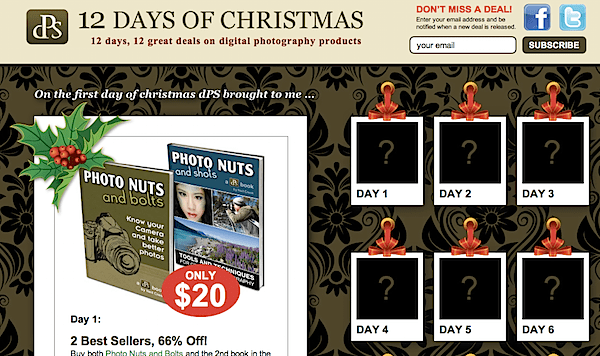 Mid-December 2010: on my photography site, we launched a new campaign—our first ever 12 Days of Christmas promotion. The result was my biggest month of earnings ever up to that point. The idea was simple: offer discounts on 12 products over the 12 days leading up to Christmas. I used a mix of my own ebooks and products from other photography sites with affiliate commissions. The result was massive. Not only did we see some great revenue generated, it created some lovely buzz on the site. Due to the success of the 2010 campaign, in mid-December 2011 we launched our second 12 Days of Christmas promotion. This time around we made some changes and evolved things a little. The result? It was big. I’ll tell you more about just how big below. A number of my Twitter followers have been asking how it went and how we changed things this time, so here’s a quick snapshot of the changes and lessons we learned. Last year, I ran the promotion completely alone. I’d seen similar promotions on other sites and thought it’d work well on dPS. But never having done such a promotion, I made numerous mistakes and spotted many ways I knew it could be improved. So I brought the Web Marketing Ninja (regular guest poster here on dPS who recently revealed his identify) on to manage it for me. The Ninja worked hard on adding some of the new strategic elements mentioned below into this year’s promotion. Plus, his work took a massive load off my shoulders in terms of the day-to-day running of the campaign. 12 Deals in 12 days is a big task—that’s 12 sales emails, numerous blog posts, loads of tweets, liaising with partners, and more. I decided this year to take the opportunity of sending out 12 emails to our list in 12 days to test out a new email newsletter provider: MailChimp. I’ve wanted to test out this service for a long time based upon the amazing feedback it constantly gets from other bloggers. I’m very glad that I have tested it, because so far, using MailChimp has been a real pleasure. Their interface is really intuitive and their technology is innovative. Deliverability rates were high, support staff were really helpful, and there are loads and loads of add-ons and extras that you can plug in to make the service even more powerful. If you’re in the market for an email newsletter provider, I can certainly recommend you check MailChimp out (yes, that’s an affiliate link). Probably the biggest change we’ve made this year is to create a central landing page for the promotion. You can see it in full here (although all the deals are now over, so it’s not active). This is the work of the Ninja at his finest. Last time, the promotion largely happened around a series of sales pages, but there was no central place to tie it all together and build buzz. This year, having the central landing page worked really nicely. Having run this promotion once before, we were in a better position to make smart decisions about what deals to run this year on a number of levels. Firstly, we know what types of products converted last year, and could focus on those. For example, last year we ran a couple of days on Photoshop actions which didn’t perform as well as teaching resource, so we swapped out the actions in favor of some new courses and ebooks. We learned last year that the bigger discounts converted better than the smaller ones—we were able to offer bigger discounts on our own products easily, but also feed that back to the product owners we promote with the affiliate deals, and in most cases they came to the party to give bigger discounts. We saw last year that bundles of products converted particularly well, so this year’s deals were more centred on bundles (around half of the the days’ deals) rather than single products. We were also in a better position this year to negotiate better commissions with some of our partners, having shown them what we could do last year. Interestingly, word had gotten out about 2010 and this time around I had potential partners pitching us to be involved months out from December. Use clear calls to unsubscribe: One thing that I’ve done in both campaigns is to give our newsletter subscribers a very clear way to unsubscribe right up front. Our first email explained the next 12 days’ program (and the fact that we were about to send 12 emails), and acknowledged it wouldn’t be for everyone, with a clear call to unsubscribe if it wasn’t of interest. Of course in each email we sent there was a similar call to unsubscribe. Note: we set up a separate email list for this campaign so that subscription cancellations wouldn’t stop people from getting our weekly newsletter. Feedback on this from readers was excellent. Super deals: We suspected that some of our deals would perform better than others, based largely upon last years results. As a result, we placed these on mid-week days (Tuesdays) to give them the most exposure possible. I also gave them extra promotion with blog posts on those days (I didn’t post on the blog for every deal). Diversity of deals: One thing that we were very aware of and tried to balance was mixing deals up so that readers didn’t get 12 invitations for fairly similar products. We did deals on physical products, software, ebooks, courses, and other teaching formats. Give some “space” in the lead-up to your campaign: We purposely didn’t promote anything to our readers for a good month before this campaign. While we could easily have launched a product or promoted an affiliate campaign late November or early December, I didn’t want to push our readership too hard. In fact, I sent an extra email or two in that period that was simply free good content. The same goes for afterward—we had a great new ebook on post-processing ready to launch mid-January, but pushed it back a week to give a little more space for our readers to “recover” from December. Be organized: The biggest tip I can give is to be organized. Work on partnerships for a month or two ahead of time, start working on sales emails as early as possible, and so on. The more you do ahead of time, the better, as there are always last-minute things to take care of. In 2010, this campaign contributed to December being our biggest month ever, up to that point. This last 2011 campaign saw us almost triple revenue from 2010. We have a new record-breaking month! I did invest more into the 2011 campaign—paying the Ninja, investing some money into the design of landing page development and design, and beefing up our web hosting—so profit wasn’t tripled, but it wasn’t far off. While this was a highly profitable way to end 2011, I can’t emphasize enough just how much work goes into a campaign like this. The 12 days itself were intense, with a lot of late nights and quite a bit of juggling. For example, on one of our last nights we were preparing to go live when we realized the coupon code a partner had given us didn’t work. We had to quickly switch deals over, as it was a weekend and we couldn’t contact the partner. Of course, along with the work comes a lot of fun. I’m coming to realize that there is a real rush that comes with launching products. Devising strategy, implementing it, and then waiting to see how things convert is a lot of fun (for me and the Ninja, at least). Doing 12 launches in 12 days just multiplies that! Another big benefit—beyond profit and fun—of this type of campaign is that you learn a lot about your readership. In running 12 deals in 12 days, you get to test out a lot of different things. For example, this year our products included physical products, single ebooks, ebook bundles, courses, and software. Price points were also interesting to watch—products ranged from $17 right up to $180! While dPS has traditionally just published ebooks at a pretty similar price point, we now have some great information on what other types of products and price points our readers are interested in. So with the 2011 12 Deals of Christmas behind us, we’re already thinking about how we can make the 2012 campaign even bigger! Thanks for being candid about the amount of work that really goes into developing a successful campaign like this. I’m happy for your success and can’t wait to see the results of your next campaign. Why did you choose Tuesday specifically for marketing your super deals? Wouldn’t towards the end of the week provided you with more viewership for those deals? We’ve found that Tuesdays typically have higher conversion rates when we’ve launched products. So we launched the super deals on the super days. But those days might be different for your audience. Testing will answer that. Interesting, but I suppose not unexpected results when you look at the opportunities for improvement you had on an already successful scheme before. The biggest takeaway for me is I must make sure to improve on anything I’ve already had success with. I’m in the habit of thinking that the method is successful, and I therefore don’t want to break it, I suppose you never get anywhere standing still. Side note: Is it weird that although I don’t really have much of an interest in photography I’ve started following dPs just so I can check out the newest tricks Darren’s trying? I shouldn’t think I’m the only one. Excellent case study, Darren. Love the idea of creating landing page for Christmas and having an clear call to unsubscribe. Gonna steal some ideas for my new project. Biggest take away: people love choices and deals. Thanks for breaking this down for us Darren. It has certainly given me food for thought. Just wondering Darren. You mentioned photography affiliate sales, were you driving your subscribers to affiliate offers directly through the newsletter or driving them to your landing page first? We actually did a combination of both. Some of our partners went to the length of setting up dedicated landing pages that were in the same theme as the landing page, so we sent them directly. Others we sent them via the dPS landing page. Simple works. Again and again, we see this. You stuck to basics, made a few basic tweaks and kept the customer or subscriber in mind at each turn. Making unsubs much easier illustrates this. Make things easier for your subscribers and you will have more subscribers to make things easier for. It’s simply customer service, cyber-style. Changing the landing page provided a breath of fresh air too. I changed mine a little while back and noticed a nice little surge in numbers. Keep it simple, clear and heavily focused on benefits. We think in terms of benefits, not features, and when you make it easy for your readers to clearly see your benefits, sales increase. As for organization, the outer world mirrors the inner world. You accomplish much more if you organize yourself mentally. I am huge on personal development to reduce mental clutter, and with less mental clutter I move into more effective action, no matter what I do. Set aside tons of time to organize, clear your mind and move forward from a calm, confident place. Wonderful things happen in your life with this mindset. Congrats again and thanks for sharing your insight. Good advice. Seeing your fantastic results is very inspiring. It’s amazing what an adjustment can do. And having the help of a friend:) I love mailchimp they are super quick to reply when I have a question or concern, and they always go the extra mile to help when I ask. I understand the rush of a new launch and all the work it entails. Tonight (in Vegas) I was working on some of my book edits, half way through, the power went off, ALL of the power. It came back on of course some weird surge I guess or maybe the Luxor was a little too bright tonight. However it was off just long enough to erase every little change I made. I don’t know if you’ve ever watched the movie “The Money Pit” The scene where Tom Hanks is so over all the repairs and can’t take anymore and then he falls through a whole in the floor but gets trapped and just hangs there pretty much laughing in a “hysterical what else could possibly happen” sort of way? Congrats on you 2011 12 days campaign success. It really inspires me. Thanks for sharing this case study promotion. I’ve always found that well planned holiday promotions can be very profitable. You’ve given me some ideas that can take them to the next level. Thanks! I really enjoed this post and would love to read more like them – especially from the ninjas perspective :) You should get him to do a paid newsletter for people who want the high end information – and perhaps bring him on to do the Problogger Deals you launched a while back! Question – Are you planning on using MailChimp for your newsletters and staying with AWeber for all other emails you send out to your list? I was under the impression that you use AWeber for your email lists and related communication. I hear such good comments about AWeber that I was considering using it, but I have also looked at MailChimp. As a novice, it seems like using one contact package all of my communication would be best. If you have a moment, could you share your thoughts on this? Good to know even when you think you’ve hit the top, you can always keep getting better! Congrats on your success…always inspiring to see results of your campaigns. That just goes to show that we are always growing and learning. Never think you know everything because eventually everything we know will become obsolete and we won’t know anything! Making a dublicate off lists in Mailchimp is not clever because it woundt copie the [email protected] adresses. Because off roll based.. So..
Great Information. I look forward to using this case study to help myself and others grow their business and site.